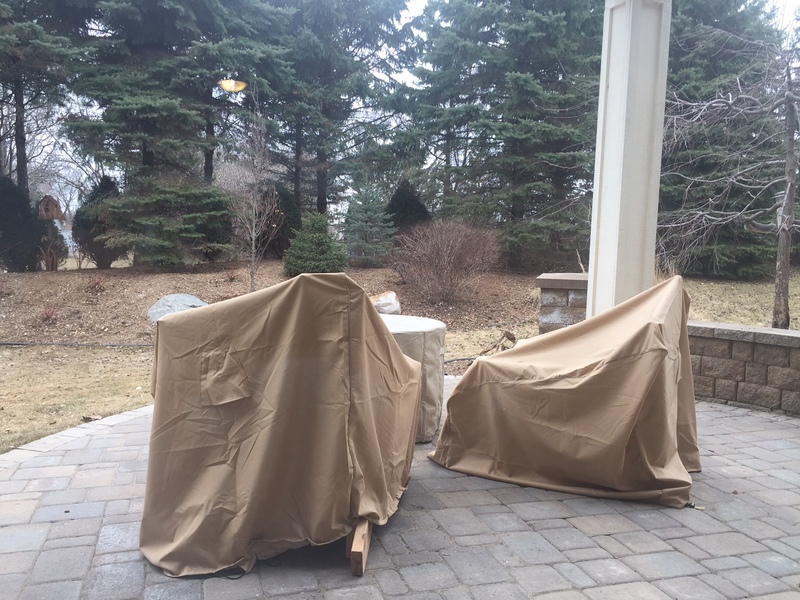 There is generally a point, during any Minnesota winter, where local residents begin to wonder if it will actually ever end. Not every year, but quite often. At first, as winter begins, the snow is “pretty” and the cold is “refreshing” while it’s also nice that the mosquitos, geese, and other pests have all left or are in hiding. But once it’s late February and then into March, if the white stuff is still piled high and the thermometer is refusing to cooperate, it gets to be something we’re all collectively “over” and all we really care about is spring. I haven’t forgotten. 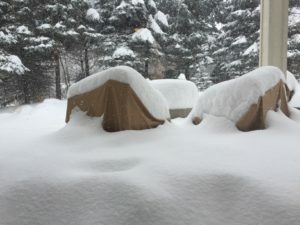 It was our “Men of Woodbury” weekend getaway to the North Shore of Superior and we got snowed in. 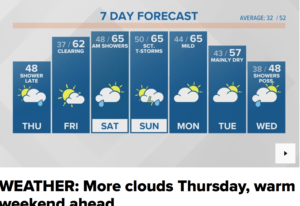 Fortunately, and I’m really tempting fate here, the weather patterns right now show “no sign of anything like that happening this year” according to Belinda Jensen, the aforementioned esteemed meteorologist for KARE11 here in the Twin Cities. I believe her. She’s good at her job. Our back patio today. Spring is in the air! I think the key to all this was my trip to Kauai. While I was gone, Minnesota turned the corner. By the time I got back, a lot of the snow was finally melted, and now all that’s left is stuff that was piled up very high, or is in the shadows and gets no sunshine, or both. And the thermometer has been pretty friendly as well. So, clearly, all I had to do was leave for 10 days. Perhaps the entire population of the Twin Cities, if not the entire state, should participate in a GoFundMe campaign to cover the costs for me heading back to the island next year. And every year after that. Sounds fair. I can do it. I’ll take another one for the team. Things I have done: I hooked the drain hose back up to the sump pump PVC pipe on the side of our house. The long black hose runs down the side of the house to a collection box in the back. That box collects whatever the sump pump spits out as well as water from a downspout, then sends it all down an underground drain line to another buried line, which runs downhill to a pond. So, the water from our gutters and our sump pump ends up directly in that pond, which is a good 100 yards away. But only during the warm months. As you may recall, I can’t leave that hose hooked up during the winter because the first hard freeze will turn the collection box into solid ice and then the line will back up all the way to the PVC pipe, until the pump can’t actually pump and it burns out. That would be what we call, in technical terms, a really bad thing. It’s a big day when I get to hook that hose up again. I also took the rubber floor mats out of my car and will put the carpet mats back in today. I’m waiting for my car to “air out” a little more, though. 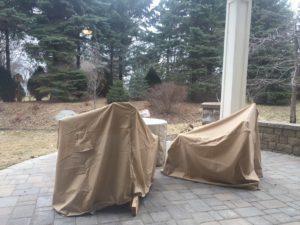 It’s sitting in the garage with the windows down, because a harsh Minnesota winter will include the unavoidable fact that your shoes or boots will be dragging plenty of slush and snow into the car. Within that slush and snow is often a considerable amount of road salt. That salt dries and adheres itself to the permanent carpet in the car. All around the edges of the rubber mat, the salt will dry on said carpet and it seems to stick to it at the molecular level. No brush, rag, or vacuum can get it off. But, warm water mixed with vinegar will. My car still smells like Easter eggs. One more day and we should be good. It’s also time to turn on the outdoor water spigots. That all has to be meticulously shut down for the winter. Once the two outdoor spigots are on I can do things like topping off the hot tub without having to run buckets of water out there, one at a time. I can also clean the garage floor completely, removing the last vestiges of gravel, salt, and dirt dragged in by the cars all winter. It’s a process. Welcome to the Twin Cities, Final Four fans! As you can see here, the forecast for the weekend is really good. And that’s great for the Twin Cities and US Bank Stadium as we get ready to shine on the national stage one more time. The NCAA Final Four is here for the weekend, and the excitement in downtown Minneapolis is building fast. Our last big national moment was the Super Bowl, just a little over a year ago. As many may recall, it was classic Minnesota winter for the football game. Subzero temps and biting winds. We heard a few complaints by media members who only want the Super Bowl to be in warm-weather resort cities, but the vast majority had a great time, experiencing what we’re used to along with all the Minnesota Nice. This weekend, everyone will get to see another side of Minneapolis and the Twin Cities. Should be great! And I’m not letting that high of 48 on Tuesday scare me. It was 27-below not too many weeks ago. One week ago, the Twins opened their season at home, in Target Field. When the schedule was announced many months ago, there was quite a bit of disbelief that MLB would not only have the Twins open at home, but have it be the earliest opener in baseball history, on March 28. The odds of it being very bad, versus OK, seemed to be about 100 to 1, but we dodged the bullet. Heck, they were still removing snow from Target Field just a few days before the opener. It was actually sunny and about 50 for the opener, which looked quite comfortable, but it did slide back into the mid-30s for home games two and three over the weekend. Still, considering the team had something like six early games either snowed out or postponed due to bitter cold last year, it was a fine way to kick off the season. 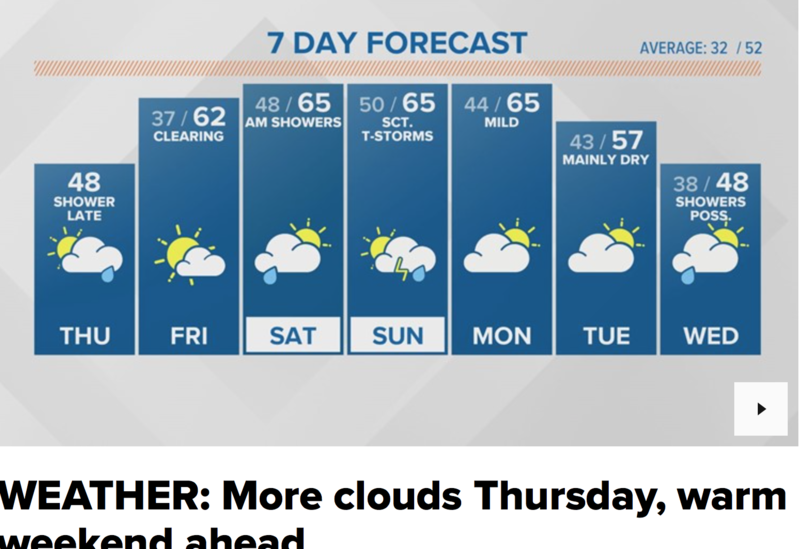 What confuses me, though, is that MLB now ignores the weather facts when it comes to where the first few games of the season should be played. 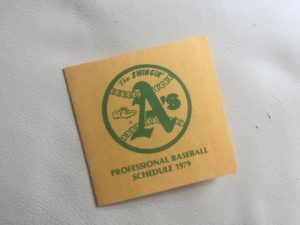 Many years ago, after a terrible start to the season due to weather, MLB instituted a schedule for the following year that had warm-weather ballparks or domed stadiums hosting at least the first series of the year for every team. The Twins play in the AL Central, which boasts no indoor parks and where the one market that might be considered “warm weather” would be Kansas City, which is not generally warm this time of year. Why not have the entire AL Central open in domes or warm-weather towns? I get it that the cold-weather teams don’t want to have to habitually open the season on the road, but that’s got to be better than the overwhelming odds of starting the season in late March, in Minneapolis. We’re lucky to have gotten away with it this year. On a different baseball note, however, there is this little gem. Found it on eBay a week ago, and just got it. 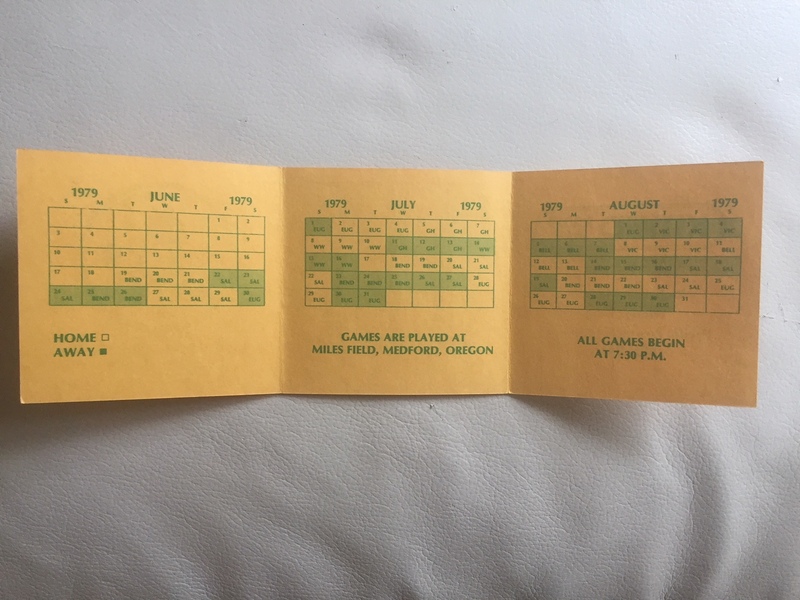 How does one find a 1979 Medford A’s pocket schedule? 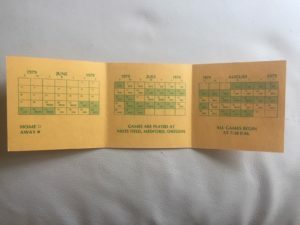 Believe it or not, there are people who collect pocket schedules as a hobby. Lots and lots of people, collecting lots and lots of pocket schedules, from MLB and NHL all the way down to the Northwest League. This one was listed as “mint” for its condition and the seller claimed it had never so much as been opened or unfolded. After getting it, I believe that. I think I’m the first human to unfold this thing. 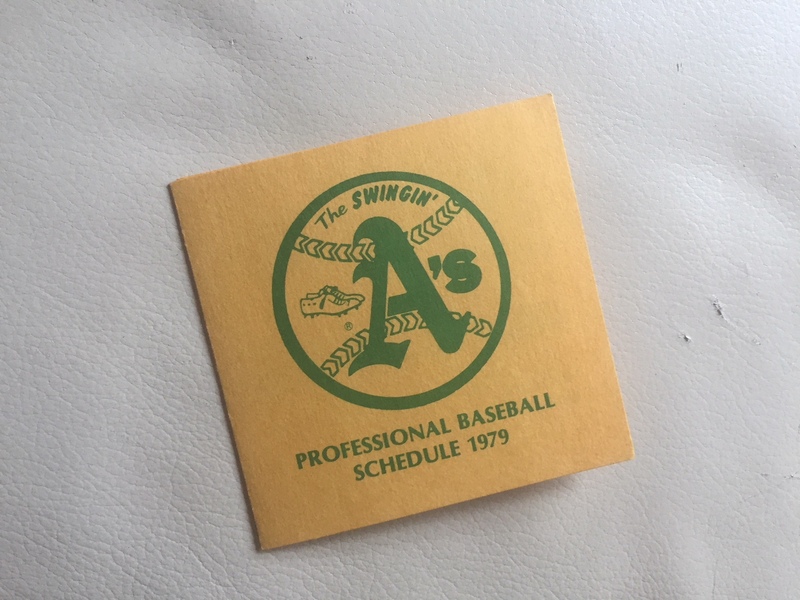 I wanted it because I’ve never been able to find the full 1979 Northwest League schedule. Plus, I knew that just looking at our home and away games would fire up some more vivid memories. What I didn’t expect was to discover that what I thought was my photographic memory actually had some things wrong. I thought we went to Grays Harbor on the same road trip when we went to Bellingham and Victoria, BC. We did not. The trip to Grays Harbor was on a road trip with a series against the Padres in Walla Walla. But, just by looking at this thing I could definitively see that the day I got hurt by taking a Louisville Slugger in the face and mouth was June 28. I know this because after two home games with me in the radio booth, complete with grotesque bloody bandage on my face, the team went on the road to Eugene for two games and I didn’t go. I was stuck in our apartment with no car, a right eye swollen completely shut and adorned with all sorts of wild colors, and teeth so loose I could probably have spit them out. It wasn’t a great time to be me. It’s easy enough to spot the road trips where our bus broke down, too. The first would’ve been the night of June 26, driving back to Medford from Bend. OK, it was after midnight so it would’ve actually been June 27 when it broke down around 2:00 in the morning. For that one, my roomie Mike Altobelli and I jumped in a couple’s car and they gave us a ride home. The next one would’ve been the night of July 16, on our way home from Walla Walla. We finally got home late on the 17th in a school bus designed for grade school kids. The luxurious pampered life of a minor league ballplayer knows no bounds. It also included seven of us sleeping on the floor at the radio announcer’s house. And $8 a day in meal money on the road. And 15-hour bus trips, but only if the bus didn’t break down. Plus, by this point I was getting paid the enormous sum of $700 per month. Rich, I tell ya. Filthy rich! Actually, the memories are just that. I’d do it all over again for the same money, if I could. So that’s about it for this week. If you end up watching any of the Final Four just wave at the TV screen. I won’t be at the games but you’ll at least be waving in my general direction. As always, if you just read this blog installment and thought it was “jolly good stuff” please do me the ultimate favor of clicking on the “Like” button at the top. I still working on my “Like Button” merit badge. Bob Wilber, at your service and collection pocket schedules. Or actually not. This one will be fine for now.